1. Preheat the oven to 350’F. Line cupcake pans with paper liners. 2. In a medium bowl, combine the flour, baking soda, salt and cinnamon. Whisk together and set aside. 3. In the bowl of an electric mixer, combine the butter, vanilla and sugar and beat until blended and smooth. Beat in the eggs one at a time. Make sure to mix well after each addition. You want to make sure the eggs are well incorporated. 4. Mix in the mashed banana. Set the mixer to low speed and then slowly incorporate the dry ingredients until the mixture just comes together. Gently fold the pineapple, nuts and coconut with a spatula until evenly mixed. 5. Divide the batter between the prepared liners. Fill each cup approximately 3/4 full. Bake the cupcakes for 20-22 minutes or until a toothpick inserted in the centre comes out clean (or with a dry crumb). Let the cupcakes cool in the pans for 5 minutes and then transfer to a wire rack to cool completely. 6. To make the icing, combine the cream cheese and butter with an electric mixer. Beat on medium-high speed until the mixture is smooth (about 2-3 minutes). Mix in the vanilla extract. Gradually beat in the icing sugar until it is totally incorporated at a low speed. Once incorporated, increase the speed and then beat until icing is completely smooth. 7. Frost cupcakes as desired. See Annie’s Eats step-by-step instructions if you’d like to add dried pineapple flowers to the tops of the cupcakes for a stunning garnish. 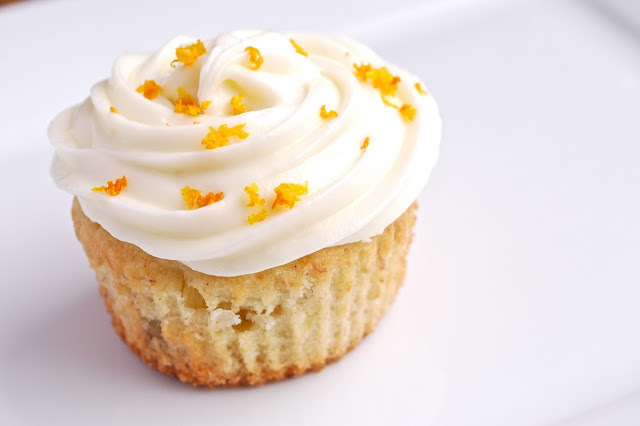 I did not have time to make the dried pineapple flowers, so I just grated some orange zest on top of each cupcake.